Honor the memory of freedom fighter Tyrone Rashad Williams | Fight Back! The Williams family homes have always been a hub of struggle. 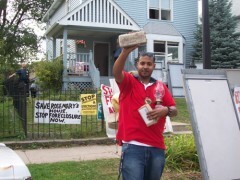 In 2009, Tyrone was part of the fight to stop the foreclosure of their house in South Minneapolis. Hundreds rallied around them, even as police arrived to evict the family during preparations for a birthday party for Tyrone’s oldest son. Since then, Tyrone stood on the front lines to demand justice for others killed by police, including Philando Castile, Chad Robertson and Cordale Handy. Tyrone is also remembered as a water protector for his part in the actions at Standing Rock. He worked to build unity and fight oppression, including through the Black Coalition, which started as a clothing line, but expanded to be a community organization, the Black Coalition for Social Justice and Community Defense. Tyrone is not someone who wasted time. He was always a comrade who led from among the people. Speaking out for justice last week, spending his last hours with his children, he was an example for all to follow. He will be honored on Saturday, April 14, with a memorial procession and service. The procession will begin at 10 a.m. at 4th Street and West Broadway Avenue. An 11 a.m. visitation/wake and 12 p.m. funeral service will take place at Shiloh Church at 1201 W Broadway. The repast will be at 4 p.m. in the gym at Harvest Prep Academy, 1300 Olson Memorial Highway.